Oh dandruff. You flaky white devil. And here’s the first thing you need to accept about dandruff: it isn’t easy to get rid of and you most likely will deal with it your entire life. I sometimes read about someone claiming to have “cured dandruff forever!” Well, good for them. But I’m pretty skeptical that they cured it forever. Like the terminator, dandruff will be back. Especially if the type of dandruff is seborrheic dermatitis, which is the most common cause of scalp flakes. You can read my summary on seborrheic dermatitis here, but basically it’s oil and yeast that causes a rash. The rash is itchy, flaky and sometimes red or yellow. So while I know I’ll always be fighting with this obnoxious condition, I have crowned a new hero in the flight against flakes. I have discovered a NEW FAVORITE product for taking down the scaly beast: Scalpicin 2 in 1. It’s an over-the-counter product that you can sometimes find at drugstores or buy on Amazon. (Get subscribe and save because you’ll want to keep using it. And you need a lot.) Basically its a 3% salicylic acid/aloe/vitamin E solution that comes in a handy squeeze bottle so you can apply it all over your scalp, without it getting your hair grody. Unlike dandruff shampoos, you just leave it on. Back when I struggled with acne, salicylic acid always did the trick (benzoyl peroxide always dried me out and irritated), so I’m not at all surprised that it worked on my seborrheic dermatitis. Remember, seborrheic dermatitis is NOT about dryness. You don’t have dry scalp! You have an oily, yeasty, rashy scalp! So salicylic acid dries it gently and kills the bacteria. I’m not saying it will work for everyone, but it has done wonders for me. When I got my first bottle, I went a little crazy, applying it OFTEN and LIBERALLY. I used up that entire bottle over the course of a weekend, but you wouldn’t believe the results. Now I continue with my usual dandruff routine (cycling shampoos), but instead of having to do it daily (and with “not bad” results), I use the medicated stuff just 2 – 3 times a week. In between, I use tea tree oil shampoo that I pick up at Trader Joe’s. And my scalp is better than ever. I use the Scalpicin 2 in 1 a few times week. 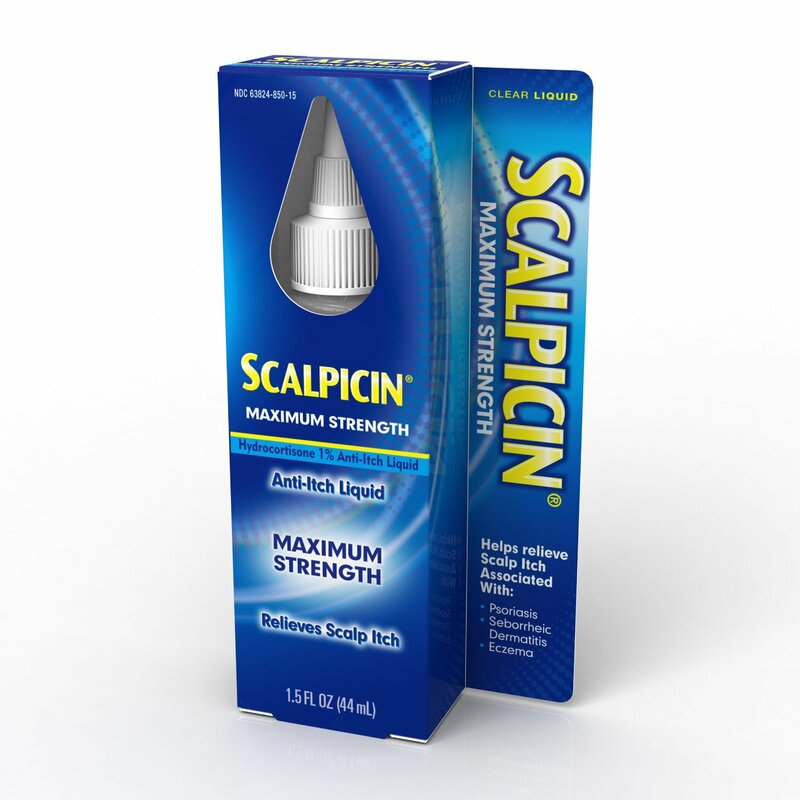 If you really struggle with the ITCHINESS of dandruff, you might be more interested in Scalpicin Max. This is a hydrocortisone solution so it relieves the itch fast. 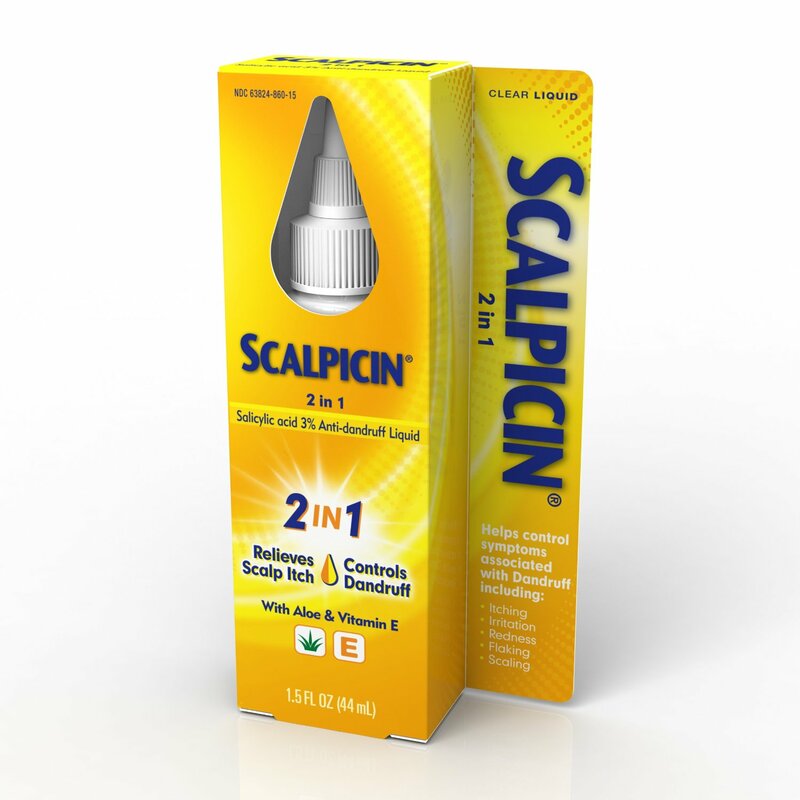 I haven’t tried it because I don’t struggle too much with the itchies and also because I just love the Scalpicin 2 in 1. To be clear Scalpicin Max does NOT have salicylic acid, so it’s more about relieving your symptoms than curing the source of the problem. However, if you are constantly scratching your head, that will only make the dandruff worse so this product could be YOUR cure. Good luck and let me know if Scalpicin works for you! It’s a lot of trial and error when it comes to skin/scalp care, so share your results with us. I’d love to hear your Scalpicin review, good or bad.